In general, I’m not keen on surprises. I guess that’s why sock clubs/yarn clubs have never really appealed. But somehow, I managed to sign up for one of Fyberspates‘ many clubs back in January. 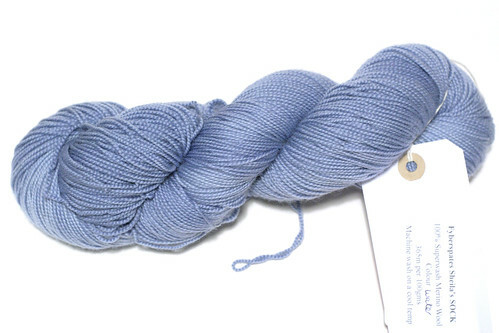 Well… it seemed like a guilt-free way to acquire some very nice yarn – by the time each parcel arrived I would have used up some of my stash (or something). I’m very pleased that I did, I love what I have received so far. Fyberspates offered a wide selection of clubs – single skeins to jumper quantities delivered monthly, you choose the yarn and whether you want semi-solid or variegated colourways, ensuring that all the surprises are the kind you like. I went for Sheila’s sock (4 ply superwash merino), in semi-solid colours. February’s parcel was a sophisticated shade of pale blue (not a baby blue), something I would never have chosen for myself but I love it. 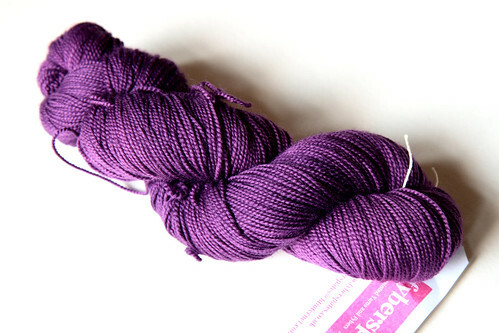 March’s parcel was very much something I would have chosen, a deep plum. The two colours go so well together, initially I was thinking of combining them for some stripy socks or handwarmers, but I’ve decided to wait and see what I receive in April! Those are both beautiful. I really love the blue. I’ve always been a bit fearful of sock yarn clubs in case I get a load of clown vomit yarns but this sounds like a great scheme. Looking forward to seeing what you knit!